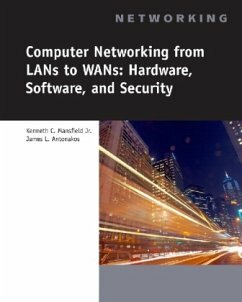 Designed for the beginner yet useful for the expert, COMPUTER NETWORKING FROM LANS TO WANS: HARDWARE, SOFTWARE, AND SECURITY covers all aspects of computer networking. Hardware details such as the operation of Ethernet, network media and devices, including hubs, switches, routers, and physical topology, are provided, with many design and troubleshooting examples. Software details such as the operation of the TCP/IP protocols, routing protocols, and network operating systems are examined. Applications, such as FTP, Telnet, and email are explained in detail, as are the requirements of writing client/server applications, with several working examples provided. Techniques for applying security to networking and computing activities are covered, including network management, secure communication methods such as SSH, TLS, and VPN, and the fundamentals of forensics. A strong pedagogical approach introduces each new topic with practical, real-world examples, and step-by-step Hands-On Projects. A companion CD includes videos and numerous files that allow students to perform important hands-on networking, security, and forensic activities. PART I: NETWORK HARDWARE. 1: What Is A Computer Network? 2: Network Topology. 3: Networking Hardware. 4: Ethernet Technology. 5: Token Ring, Fddi, And Other Lan Technologies. 6: Network Design And Troubleshooting Scenarios. PART II: NETWORK PROTOCOLS. 7: Low-Level Protocols. 8: The Tcp/Ip Protocols. 9: Ipx/Spx, Appletalk, And Other Network Protocols. 10: Switching And Routing. 11: Network Management And Security. PART III: NETWORK APPLICATIONS. 12: Electronic Mail. 13: Ftp And Telnet. 14: Multimedia Networking. 15: The Internet. 16: Writing A Network Application. PART IV: NETWORK OPERATING SYSTEMS. 17: An Introduction To Networking With Windows. 18: Windows Domains. 19: Unix And Linux. 20: Other Network Operating Systems. PART V: SECURITY AND FORENSICS. 21: Cryptography And Security. 22: Security Hardware. 23: Security Software. 24: Forensic Techniques.Glossary: Appendix A: Internet Milestones. Appendix B: Extended Ascii Character Set. Appendix C: Modems. Appendix D: Network, Security, And Forensic Certifications. Appendix E: Telecommunication Technologies. Appendix F: Setting Up A Networking Repair Shop.